The star, Aura-Aura, has fallen from the sky. Climb back into the sky using the Control Pad and A Button to leap between grapple points and launch yourself ever higher. Don't fall off the bottom of the stage or you lose and have to start over. Grab power-ups and avoid the enemies and obstacles to reach the goal. 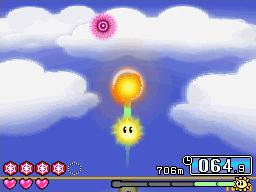 There are 10 stages to play through in Score Attack mode, or you can play an Endless stage and reach for the high score.